You've known for a while what your next step in life was going to be. You've had enough of the cut and dry, frankly, it's time to be a tad more flamboyant. And we don't think there's anything wrong with admitting that! In fact, we say we'd encourage it. Even if it's only for one night a year. On Halloween! So, what we're saying is, we think you should become the Funky Leopard Dude this Halloween. You'll be one cool cat, and that's going to be because you've got leopard spots all over! 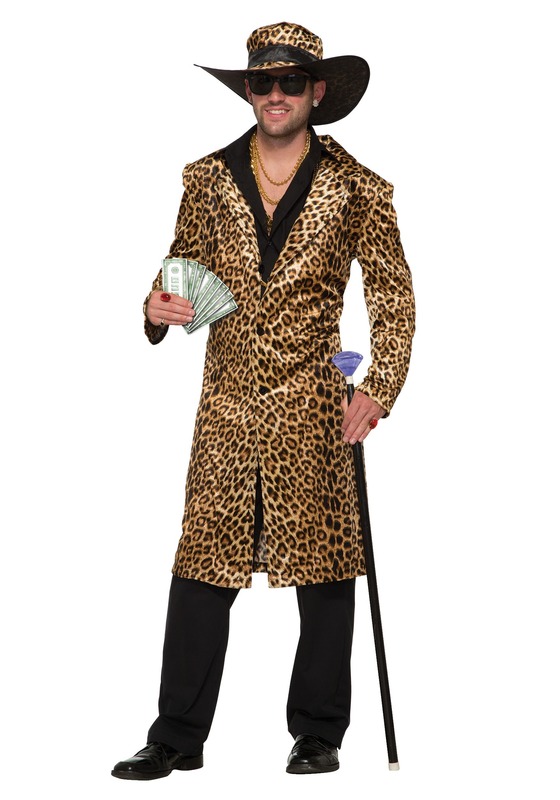 And all you have to do is pick this Mens Funky Leopard Costume. It's got a bold, outlandish style, and it's ready for a whole lot of costume fun! This Men's Funky Leopard Dude Costume comes with a jacket and hat. The jacket is 100% polyester velour, and the hat is polyester velour with a polyurethane foam backing. Both feature the allover leopard print. The jacket features foam shoulder pads to enhance your profile, and the hat has a memory wire in the brim edge to get the style just right. You just need your own black shirt, pants, and shoes to assemble the perfect ensemble. We, of course, have plenty of funky accessories to further enhance your dudedom, and we have some of them pictured, like jewelry, play money, a cane, and sunglasses. They're sold separately, but highly recommended! Try out a new style this Halloween when you go in this Funky Leopard Costume. Of course, we have the world's biggest selection of costumes here at HalloweenCostumes.com, so we've got all the styles to get your friends in on the fun too. Get them together and pick out the styles for the perfect group theme, and we're sure it's going to be the most memorable costume party ever!